David Wagoner, a prolific poet and novelist, was born in the midwest in 1926. In 1954, he moved to the Pacific northwest and said that crossing the Cascades and coming down into a Pacific rainforest “was a big event for me, it was a real crossing of a threshold, a real change of consciousness. Nothing was ever the same again.” He has taught at the University of Washington since that time. He based his marvelous poem, “Lost” on teachings the northwest coast Indians gave their children on what to do if they ever got lost in the forest. 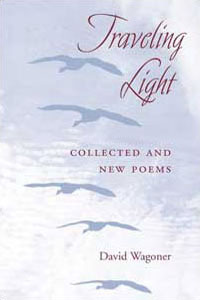 This entry was posted in Authors, Books, Poetry, Spirituality and tagged books, David Wagoner, poetry, spirituality. Bookmark the permalink. Wow.. Beautiful!..I am in the woods/nature I ALWAYS stop to listen to the life of the forest!…so peaceful/tranquil..I have always LOVED camping/hiking..it gives me inner strength! This poem inspires me in city as well as outdoors. Glad it moves you!